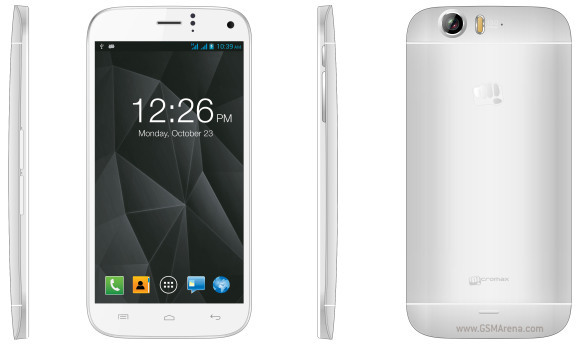 Today Micromax announced the Canvas Turbo. The smartphone comes with a 5.0-inch 1080p IPS CGS (Continuous Grain Silicon) display made by Sharp and is powered by a quad-core processor. The actual chipset inside the Canvas Turbo is MT6589T with four 1.5GHz Cortex-A7 cores, PowerVR SGX544 graphics and 2GB of RAM. The smartphone offers 16GB of internal storage, but sadly no microSD expansion slot. Naturally, the Micromax Canvas Turbo comes with dual-SIM support. You get quad-band GSM plus 2100MHz HSPA support for up to 42Mbps downlink. The rest of the Canvas Turbo specs include a 13MP rear camera with a LED flash and 1080p video recording, a 5MP front snapper, Wi-Fi, GPS, Bluetooth 4.0, and a 2,000mAh battery. 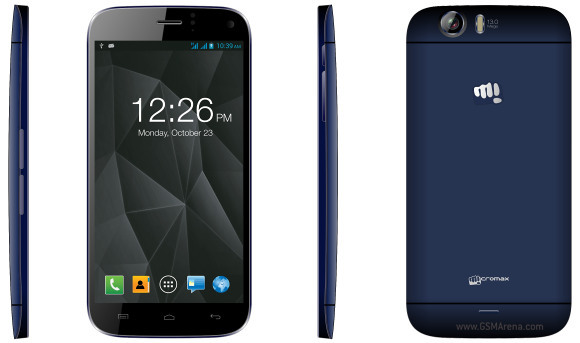 Micromax Canvas Turbo runs on Android 4.2.1 Jelly Bean and will launch in India on October 26 in Pristine White and Midnight Blue colors. The suggested retail price is INR19,990, which translates to about €235.